If you do Best in Bags or an optimization and see a giant increase to your score, you’d be right in assuming… that’s probably not right 😉 I mean, Mr. Robot is really good at his job, but even he can’t get you a 47,000% increase. 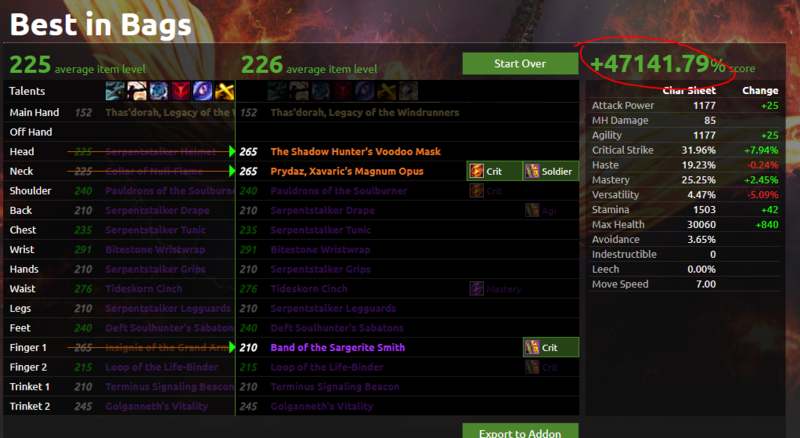 Click on the gearing strategy drop down, as shown above. Then choose multi-target (or whichever isn’t chosen). Click the save button at the top right of that menu. Then, switch back to the gearing strategy you want. Click save. That’s it – fixt. The artifact weapon probably won’t show as the right item level until you import again from the game. Some world quest gear is showing up as iLevel 210 when it should be 185. Sorry about that. Normally, we would update this within minutes of finding it out. However, the website is currently in a state of development that makes updating the item data tricky, and we don’t want to break the whole site. So this is an exception to our super-fast-updating trend – it might not be updated until BfA’s launch. I feel terrible for leaving you hanging, but wanted to be up front about it. There are some rare cases where the weapon enchant is doing odd things. We have a fix for that going out with BfA. All of the weapon complexities are coming back to us from pre-artifact days! Hang in there while we get all of that setup again. Sometimes around large patches like this, the armory has trouble too. 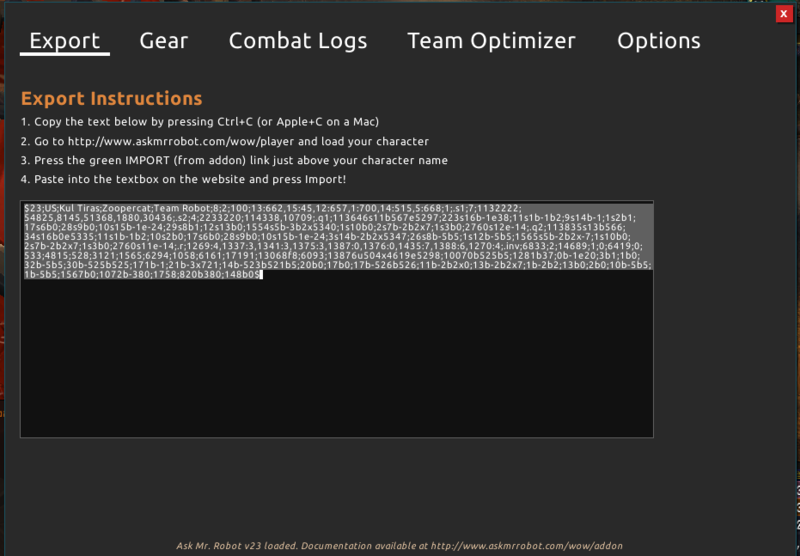 If you character doesn’t load, or the artifact weapon is the wrong iLevel, use our addon to import it. All steps are part of the FREE site. No need to subscribe. 1 – Update the Ask Mr. Robot addon. Don’t have it? Get it from Twitch or directly from our site. 2 – Optional: activate each spec one time, in game (this lets the addon read everything for each spec if you’re already playing multiple specs). 3 – Then open the Mr. Robot addon (click on the minimap icon or type /amr show). Go to the “Export” tab in the addon. Copy the text in the box on that screen. 4 – Go to the Ask Mr. Robot website. Click on your character’s name to open the character picker. Paste the text in the addon section, as shown below. 6 – After you paste it, your character automatically loads with all the right gear. There was an error importing and exporting from the addon, that should be fixed with version 60 and higher. There was also a bug where the shopping list was empty. We fixed that in version 61. For any other bugs, report them on our forums. Some addons don’t play nice and can cause errors for other addons. It’s actually quite common (and easy) to make an addon interfere with other addons, without realizing it. Most of time it is really easy to fix, so we just reach out to the addon authors when we get a report. On the lower left part of the screen, there is an addon button. Click it to open the list. Disable ALL addons (yes, all of them), except Ask Mr. Robot. Then load your character into the game. Use our addon – if you no longer get an error, that means our addon is working, and another addon is conflicting. If you still get the error, it is 100% on us (let us know here). Log out and go back to the character select screen. Turn the addons back on, ONE at a time, logging in each time you turn one back on. Use our addon. When you get the error, you’ll know which addon caused the problem. Let us know and we can see if there is anything we can change on our end. We can’t always do that, but we do reach out to the addon authors to let them know what is needed to fix it. If you’re running into something in-game, Blizzard has their own list of known issues.